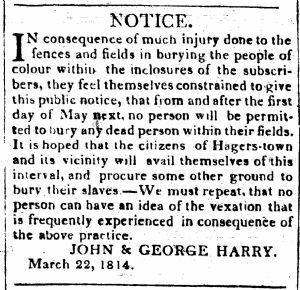 In consequence of much injury done to the fences and fields in burying the people of colour within the inclosures of the subscribers, they feel themselves constrained to give this public notice, that from and after the first day of May next, no person will be permitted to bury any dead person within their fields. It is hoped that the citizens of Hagerstown and its vicinity will avail themselves of this interval, and procure some other ground to bury their slaves. We must repeat, that no person can have an idea of the vexation that is frequently experienced in consequence of the above practice. JOHN & GEORGE HARRY. March 22, 1814.